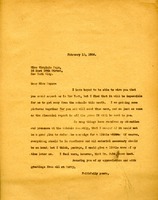 Letter requests a copy of a picture of Colonel Roosevelt printed in the Southern Highlander be provided to the Roosevelt House Library and Museum. 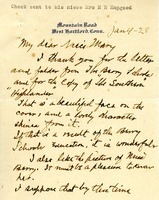 Mr. Robinson, or "Uncle Hale," writes to Mrs. Hapgood to thank her for sending him The Southern Highlander and the letter from The Berry Schools. 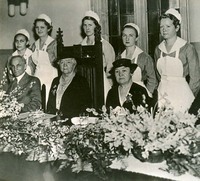 He comments on the picture on the front of the folder and the photo of Miss Berry, saying it must be nice to know her. He sends $50 for any need that seems best. 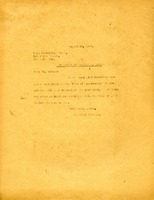 The office at The Berry Schools notes the name and address of Mr. Robinson at the bottom and at the top of the letter they note the name of Mr. Robinson's niece. 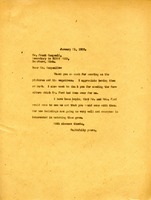 F. G. Barber writes Martha Berry a thank you letter for sending a photograph of the entrance gates and driveway of the Berry School to include in their volume on Idealism. She indicates the photograph will be included and returned. 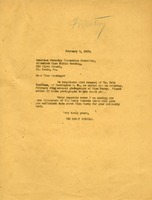 Martha writes to Mr. Campbell thanking him for the photos and negatives, as well as thanking for the furniture that Mr. Ford had done over. 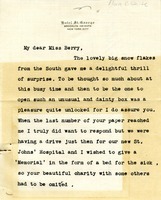 Flora C. White thanks Miss Berry for the cotton she sent her, calling them "snow flakes from the South." She explains that she wanted to donate a bed to the new St. John's hospital so she was unable to answer other appeals. 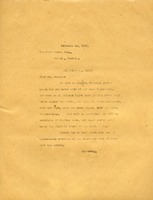 She also expresses her desire to visit the Schools and asks for a copy of the paper with the photograph of Miss Berry at her writing desk because she lost her own copy of it. 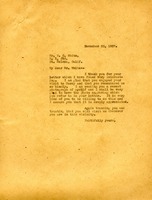 This letter thanks Mr. W.C White for his letter about his visit to Berry. 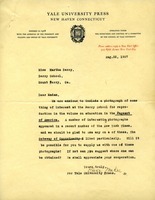 It also tells him that Martha Berry is sending him a photograph to have engraved like he mentioned in his letter. 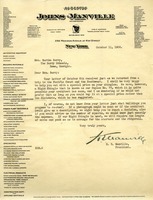 This letter documents The Berry Schools sending Mr. McKee from Yale University Press a photograph of the Gate of Opportunity. 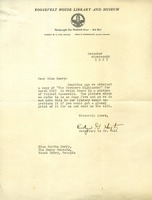 Letter to Martha Berry from Oliver McKee. 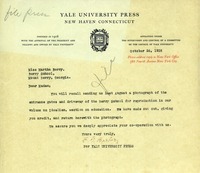 McKee requests a photograph of the Berry School for the Yale University Press volume on education in the Pageant of America. He is most interested in a photo of the Gate of Opportunity that appeared in The New York Times. This request for donations from the Berry Schools features a picture of the dormitory fire and a photo of some Berry students. A small note on the card from Mrs. C.M. Pratt notes a $250 donation.